2019 Spring Softball Registration is closed! Once again we are looking forward to another great season. We will begin to form teams and coaches will be contacted as soon as the team formation is complete. The goal is for coaches to have the team information no later than March 24th. Every effort will be made to honor requests. We are attempting to keep as many teams/players together from previous seasons as possible. If you DO NOT wish to have the same coach as last year please note that in the comment section. Also know that not every coach returns and some move up in ages. We do our best to keep as many previous players together as possible. UNIFORMS- we will be taking sizes for uniforms this year. Please order up if you are unsure. We do have to preorder uniforms and do our best with sizing based on past years. We will try to ger as close to requested size as possible but you may receive one size up. Practices will start the first week in April. Games will begin in May. Ages 10U and older will complete the season with an end of season tournament the last week of June. Dates are still tentative and will be confirmed in the next few weeks. Registration will CLOSE March 11th. No late registrations will be accepted. Registration for the 2019 season is now CLOSED. Contact the Recreation Director or Softball Director if you have any questions. Teams are being formed and information will be available soon. Below is the size chart from the vendor. Please use this as a guideline. Please make sure you are looking at the right information. We will be ordering YOUTH or WOMEN sizes, NO MEN sizes will be ordered. We will do our best to get you as close to requested size as possible. SelectTeams (10U-18U) 9 - 18 Check with your Coach! Many times we get asked about bat size and what type of bat players need. 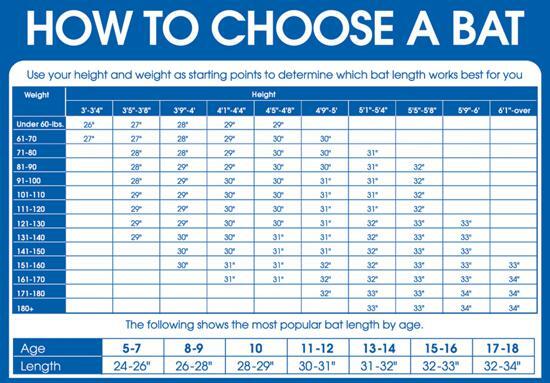 Here is some helpful information in helping you to select the proper size bat and glove for your player. Just remember, it should be comfortable for them and it doesn't have to cost a fortune at this age and level! In 2011 Papillion Softball announced the formation of a select program call the the Outlaws. This select program is for players who are both willing and possess the necessary skills to compete at a higher level than recreational softball. The Outlaws Select Team girls play in a fall league and in the spring season as well as up to 10 tournaments in the spring/summer season. The players commit to year-round practices and games and play competitive softball to prepare for play at the high school level. For more information, visit the Outlaws Teams page or contact a member of the Softball Board. I am a player who commits to the sport with every ounce of effort and energy I have to give. I am a player who shares a respect for the game and all those who play it. I am a player who will never let fear control the way I play. I AM AN OUTLAW! Your questions are very important to us! We are always looking for ways to improve our program and love feedback from our families! The following is the fastest process to follow when you have a question for a Board Member. Locate a board member at any Papillion Softball event - look for the Board Member shirts! Papillion Softball will be communicating rainouts and last minute changes this year via text messages. Please open the below hyperlink, enter your cell number and subscribe only to Papillion PRO Softball. 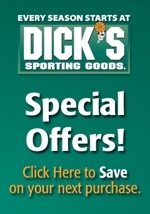 You can either cut and paste the below link, or click the picture, and it will redirect you. After you sign up, it will ask for a "validation code." Make SURE to complete the whole process. Thank you for your help in ensuring important communication is received. 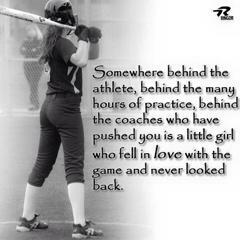 We appreciate your help and look forward to another great year of softball!